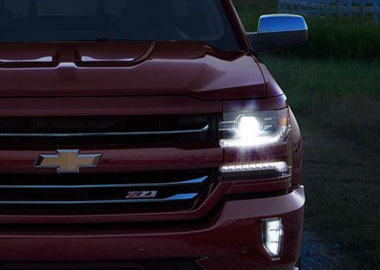 Silverado has a lineup of small block engines equipped with three proven fuel-saving technologies — Active Fuel Management™, Direct Injection and Continuously Variable Valve Timing — to provide the perfect blend of efficiency and capability. 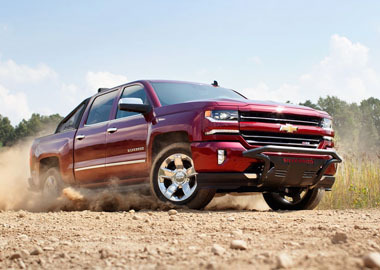 Adjusts transmission shifts to reduce shift cycling when towing or hauling heavy loads or driving on steep grades. StabiliTrak® with Trailer Sway Control automatically detects a swaying trailer and applies both the vehicle and trailer brakes (if properly equipped) to help bring it back in line. Hill Start Assist holds the brakes momentarily or until you press the accelerator, giving you extra time to switch from brake to accelerator without rolling back under certain conditions. As smart as it is strong, Silverado offers technology to keep you connected while you’re on the road. USB ports and an available 110V plug-in give plenty of options for keeping your compatible devices charged up and ready to go, no matter where the day takes you. Steering wheel controls let you answer phone calls, control the available Chevrolet MyLink® display, change Driver Information Center settings, available cruise control and safety features.